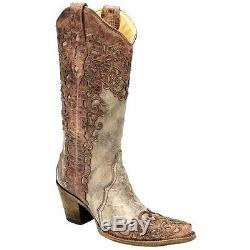 Corral Women's Circle G Cross Embroidered Cowgirl Boot. Satisfy your passion for vintage boots with Corral Boots, designed and distributed by Corral This distinctive boot is handcrafted in Mexico. This cowgirl boot features a distressed Cognac colored leather overlay, over sand colored leather foot under a matching shaft. Updated pointed toe profile and easy-on pull straps. Thanks for shopping with us. Please let us know if you would like to return your item as soon as possible. We must receive the product to us within 30 days. It is very important we receive the item with the original packaging. All exchanges must be unused, in new condition, no hair, no ware, unwashed, unworn and in the original packaging. We are unable to except exchanges on international orders. If there is an amount owed we will send you an invoice for any amount that may be owed. Defective Items: If you receive an item that is a material defective please notify us within 5 days of receiving the item. The item "Corral Women's Laser Overlay Fashion Western Boots Sand Cognac size 9" is in sale since Friday, June 9, 2017. This item is in the category "Clothing, Shoes & Accessories\Women's Shoes\Boots". The seller is "horsegotack" and is located in Temecula, California. This item can be shipped to United States, Canada, United Kingdom, Denmark, Romania, Slovakia, Bulgaria, Czech republic, Finland, Hungary, Latvia, Lithuania, Malta, Estonia, Australia, Greece, Portugal, Cyprus, Slovenia, Japan, Sweden, South Korea, Indonesia, Taiwan, South africa, Thailand, Belgium, France, Hong Kong, Ireland, Netherlands, Poland, Spain, Italy, Germany, Austria, Israel, Mexico, New Zealand, Philippines, Singapore, Switzerland, Norway, Saudi arabia, Ukraine, United arab emirates, Qatar, Kuwait, Bahrain, Croatia, Malaysia, Brazil, Chile, Colombia, Costa rica, Panama, Trinidad and tobago, Guatemala, Honduras, Jamaica, Antigua and barbuda, Aruba, Belize, Dominica, Grenada, Saint kitts and nevis, Saint lucia, Montserrat, Turks and caicos islands, Barbados, Bangladesh, Bermuda, Brunei darussalam, Bolivia, Ecuador, Egypt, French guiana, Guernsey, Gibraltar, Guadeloupe, Iceland, Jersey, Jordan, Cambodia, Cayman islands, Liechtenstein, Sri lanka, Luxembourg, Monaco, Macao, Martinique, Maldives, Nicaragua, Oman, Peru, Pakistan, Paraguay, Reunion, Bahamas, Viet nam, Uruguay.